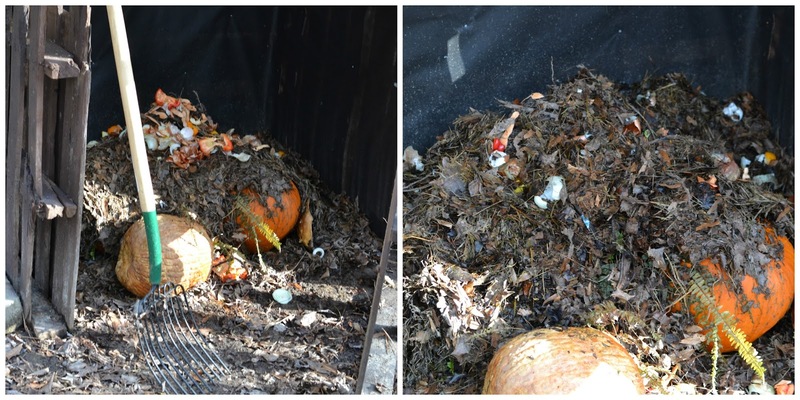 It's time to finally share our compost experiment on the blog! I've been meaning to have this published for quite a while now but there seems to be so much to share. Today's post is going to feature what we are doing and how we are doing it. The benefits of composting should be obvious but if not I'll include a few reasons why we started composting. According to the EPA, "food scraps and yard waste currently make up 20 to 30 percent of what we throw away... making compost keeps these materials out of landfills where they take up space and release methane, a potent greenhouse gas." [source] With a subscription to a local CSA and lots of home cooking we were disposing of lots of food scraps. In an effort to reduce our household waste and to turn that waste into something beneficial for the yard we decided to start a compost pile. The past owners of the house left lots of paving stones under the deck so I placed them in a U-shape that was roughly 3' x 3' and about 1' high. There are many things to consider when deciding what kind of compost system you'd like to have. We opted for probably the most simple kind - an open air pile. From my research I decided that a 3-pile system would work most efficiently. This meant we would have 3 piles (more on that below) but we would only start with one. Since we were starting with one pile I was able to use the paving stones to get a start on composting. Before I go further I'd like to say that there are a plethora of resources at your disposal on the internet but I found it helpful to go to a composting class so I could ask specific questions. I'd recommend checking out your local county extension office if you too would like to take a compost class. Once you've begun your research or your compost pile you will see "greens" and "browns" mentioned a lot. Greens and browns are what makes up your compost. Greens are raw kitchen scraps (no meat, oils, bread, dairy) and browns are yard waste. Two things that might throw you off - coffee, despite being brown, is a green and grass clippings, despite being green, are actually a brown! Greens and browns provide your compost with nitrogen and carbon. I've seen many different numbers for what ratio of greens to browns you need. One thing I learned at the compost class was you really can't do it wrong and if you are the compost pile will let you know. If it's smelly then you don't have enough browns and if it's not composting quickly enough you don't have enough greens. After greens and browns the other requirement is water - no sunlight is needed! One other loose requirement is aeration or turning the compost. I say this is a loose requirement because this primarily affects how quickly the pile composts. The more you aerate and turn the pile the more quickly it will compost. We're not very good about turning our pile. Alright - so we got the basics of composting down! 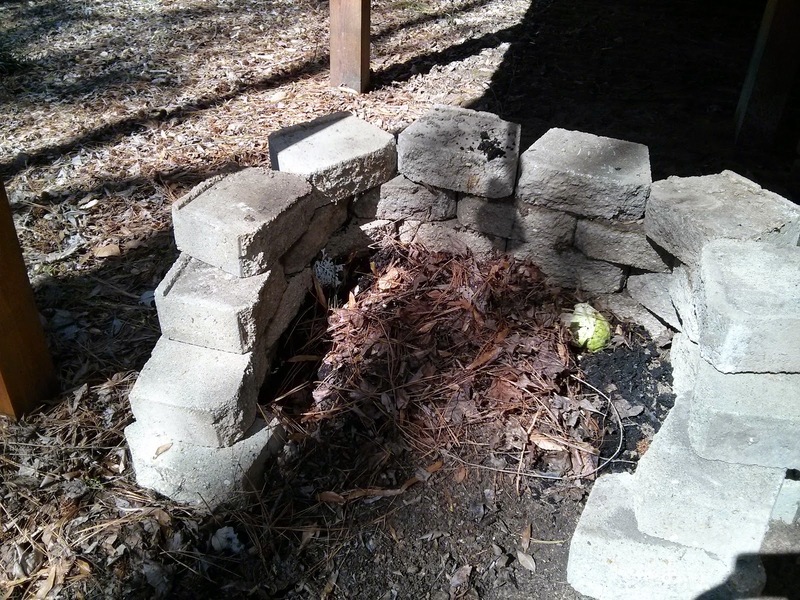 Our first open air pile in the paving stones was a great way for us to get started with composting. We learned that we could do it and it wasn't so hard! Off we set to acquire some pallets. It was time to install our 3-pile system! Our plan was to build 3 boxes. The pallets are a great way to contain the compost because the slats allow air to get into compost pile but the pallets restrict the view of an unsightly pile. Our compost piles are under our deck and this seemed to make a lot of sense to us. They're out of view from the deck and our windows but still close to the house. I guess we're good composters because we've never had any trouble with smell! The lifespan of a pile is to actively add to it for 4 months and then give it 8 months to finish composting. Turning all of the piles as frequently as we can helps them to compost. You can see in the pile snapshot above that there are no discernible scraps in Pile 1 but there are in Pile 2. Once there are no discernible scraps then you have compost! Woo we have compost! We will soon be putting compost from Pile 1 in our flower / garden beds and transitioning back to actively adding to Pile 1. This will allow Piles 2 and 3 to compost. If you start composting, or are already composting, you'll learn that you really can't go wrong and if you are you can correct it. Composting is a quick study once you get over the learning curve of not knowing anything about composting. One thing you might see a lot is that what you add to the compost should be small. For example, shredded leaves is ideal. And for that matter smashing your pumpkins would be better too. This is not necessary. We never shred leaves before placing them in the compost and I rarely break down food scraps more for compost. You will see this because the smaller things are when they go into the compost pile the faster they will break down. It doesn't mean they won't compost, they'll just be there longer. Patrick and I have all the time in the world to wait on compost to compost! What else?! I guess it would be handy to add what we do in the kitchen to prepare the compost. Originally I purchased a fancy compost container to have on the counter / under the sink but I realized that was totally unnecessary. I had also heard from a few composting friends who recommended keeping their compost in the refrigerator. 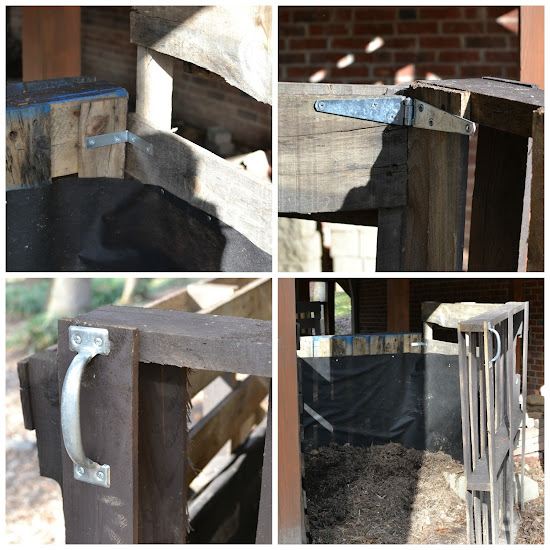 This prevents the compost from creating a stinky kitchen. I decided to go with this option. I saved up 4 large yogurt containers and we will fill up 1 at a time with food scraps. When they're all full we take it out to the compost! Well I think those are all of our composting thoughts. If you've ever considered starting a compost pile I'd strongly urge you to do so. It's a lot of fun and will turn your backyard into a science experiment! If keeping food waste out of the landfill is important to you but don't think composting is for you or don't have the space then be sure to check out local resources. Many community gardens accept compost donations and your city may have a few businesses that offer composting services. And if this was too much rambling this City of Durham site has good composting information! You really should get this submitted to a magazine/ newspaper. I am so proud of you two and how you are helping save our planet. Thanks!